Definition at line 151 of file notification-subscriber.hpp. The subscriber is not started after construction. 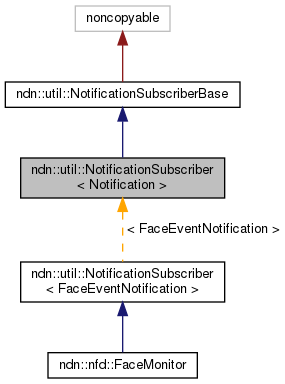 User should add one or more handlers to onNotification, and invoke .start(). Definition at line 161 of file notification-subscriber.hpp. Definition at line 155 of file notification-subscriber.hpp. Removing all handlers will cause the subscriber to stop. Definition at line 171 of file notification-subscriber.hpp.